There are five legislative assembly constituency in Mirzapur district for the 2017 Assembly elections. They are 395 Chhanbey, 398 Chunar, 397 Majhawan, 399 Marihan, 396 Mirzapur. When Uttar Pradesh assembly election 2017 is getting ready to electios new Assembly, Mirzapur is not anywhere behind in the election heat. Mirzapur district (Hindi: मिर्ज़ापुर ज़िला, Urdu: مرزا پور ضلع‎) is one of the 75 districts of Uttar Pradesh state in northern India. The district is bounded on the north by Sant Ravidas Nagar and Varanasi districts, on the east by Chandauli district, on the south by Sonbhadra district and on the northwest by Allahabad district. The district occupies an area of 4521 km2. Mirzapur town is the district headquarters. 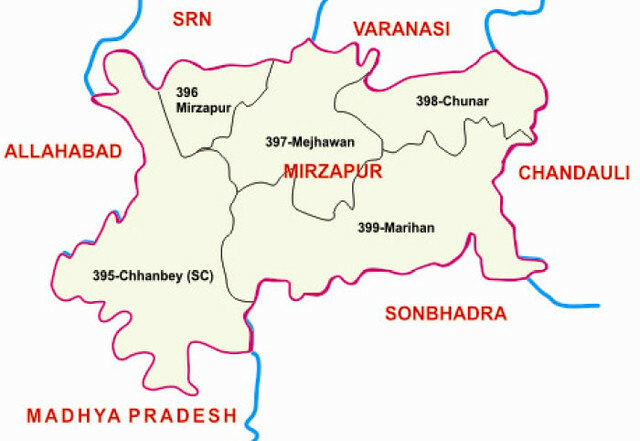 Mirzapur district is a part of Mirzapur division. This district is known for the Vindhyavasini temple in Vindhyachal. It consist of several Ghats where historical sculptures are still present. During the Ganges festival these Ghats are decorated with lights and diyas. It is currently a part of the Red Corridor.